this is Herm Edwards. he is my "old man" crush. 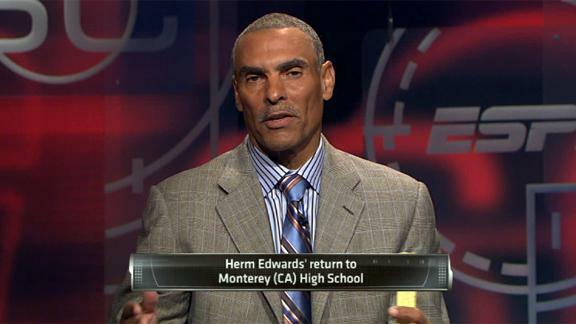 Herm is not old per se, but he is just four years younger than my mother. so he is slightly older than me. if i had an opportunity to go on a date with Mr. Edwards, i wouldn't hesitate to do so. older men have something younger men do not, smooth. and that may not be the fault of the young men. older men, because they are older, have more experience with women. and they have perfected how to approach a woman, how to compliment a woman and how to make you fall in love (please see Brandy's "Put it Down"). as a youngster, i was told that "old men will give you worms." well young men can give you things a little worse, so i'll take my chances. because i am not sugar baby age, i usually don't get approached by older men. when i do, they always hit me with the oooooweeee. in my younger days as a CD slinger for Wherehouse Music, i had the pleasure of meeting Alex English. he was an assistant coach for the Atlanta Hawks during that time and like other celebs, he came to my place of business for his music fix. because i was raised on the NBA of old, i knew who he was when he hit the door. i didn't go all "fan boy'" on him, but let him shop peacefully. as he approached the counter, i started to think about whether i should address my admiration or play cool. y'all know me, i had to let the man know i was a fan. me: hi Mr. English. i'm a huge fan, grew up watching you play. my dad is going to love when i tell him i met you. Alex English: *smiles* thanks. how do you pronounce your name? me: you are the only one to make that connection. his friend: what man? what about Tamara Dobson? Alex English: her mom named her after Tamara Dobson, Cleopatra Jones. by this time the transaction was finished. in that moment, i hearted Alex English. for those of you who don't realize what he did, let me break it down. . the Cleopatra Jones movies came out in the 70's, so he was able to get an idea of my age. he wanted to make sure i was of legal age. this was also a way to connect with me personally. i could be flattering myself by saying all these things, but his female companion was none the happy about all the grinning he did in my face when he came in the store a second time.